Howdy Y'all!! Welcome to the Tennessee Dude and Guest Ranch, where each guest receives their very own working ranch horse upon arrival! During this vacation you will have the opportunity to enjoy the life of a Cowboy as you learn, or expand, horsemanship skills as well as participate farm chores such as milking the cows, collecting chicken eggs, and feeding the goats, sheep and calf. Most importantly, you will feel right at home as you enjoy southern hospitality from our staff during your stay! If you are looking for a taste of the cowboy life this is the vacation for you! Horse Breed: Quarter Horses, TN Walking Horses, etc. Depicting one of the many incredible splendors of His creation, and nestled on a ridge that runs through the valley, is a hidden horse lover's paradise, the Tennessee Dude and Guest Ranch. Upon check in at 17:00 C.S.T. on your arrival day, each guest receives their very own working ranch horse, who will become your faithful partner while at the ranch. After check-in, you'll meet and greet your amazing new ‘horsey companion’ with carrots and apples, and then get your family settled into your horse-themed guest room. Whether you are staying a few days or a week, you will experience what life was like as a cowboy or cowgirl in the 1800's. After dinner, there’s time for a little outdoor stargazing while listening for the call of the coyotes in the valley before 'hitting the hay', or taking a night time swim in the outdoor pool under the moonlight, or enjoying roasting marshmallows over the campfire. On your first day at the ranch, there will be Rise & Shine. Before you know it, it’s breakfast time. However, it is for the horses, not for you. The horses eat first at the Guest Ranch, so keep your boots by the bed. After the horses are fed, and you've milked the cows, collected the chicken eggs, and handled any other morning ranch chores, then it's time to enjoy your cowboy breakfast on the back deck or in the Biblical-themed dining room. Following breakfast, you'll begin your first day of horsemanship training at the ranch. For beginner and novice cowboys and cowgirls, you'll start with horse safety, grooming, and basic horse care. Clean those hooves should not be forgotten. You'll be doing everything the cowboys did while taking care of their horses in the old days. Next, it will be time to saddle up and put on the bridle and finally, the whole family is ready to mount up for their first 'cowboy training session' in the ring. 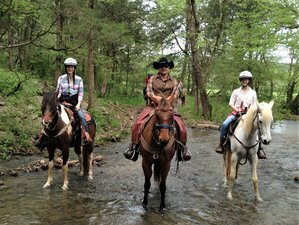 You'll enjoy some great family fun on horseback to develop (or improve) the skills your family will need while on the trail. Beginners who have never been on a horse before, through riders of all levels, will enjoy this unique horsemanship skills training session. After a couple of hours of cowboy fun in the saddle at the ranch, it's finally time for a break. Water the horses, get them some hay for lunch and head to the guest ranch house for some ice-cold southern sweet tea and lunch. But don't get too relaxed because you'll soon be back in the saddle again. Note: advanced riders wishing to hit the trail the first day may request a riding test in the arena, after getting acquainted with their horse during a short mounted session. After lunch on your first day as a beginner, for the novice or intermediate riders, it's time for cowboy training session number two at the ranch. Don't worry as this time it's just another hour or so in the saddle. This is just a little more cowpoke training and you'll be the best horse handler in the south. There's mounted games with your family to see who's the best at their new found or improved horsemanship skills. Soon, it's time to take care of your wonderful steed for the evening. You will unsaddle your horse, groom him down, feed him, and bed him down for the night. Next, it's time for a hot shower and dinner. You might play an old-fashioned game of checkers or dominos with the whole family. You will relax on the back deck enjoying the beautiful stars and listen for the coyote calls and then it's time to hit the hay. Each day is a different trail to another part of the beautiful Sequatchie Valley. Breathtaking views are in every direction you look from your saddle. After a beautiful ride and a relaxing afternoon with your beloved guest ranch horse, it's time to head back to the ranch. You’ve still got to unsaddle your horse, hose him down, feed him and bed him down for the night. Finally, another day of ranch life and great family fun will soon come to a close. Hidden just outside Chattanooga, Tennessee is an area that has remained one of God's 'best-kept secrets', the beautiful Sequatchie Valley. Tennessee Guest Ranch offers learning session about horsemanship skills and provides beautiful guest ranch horses for the guests during the program. Arrival dates Mondays and Thursdays at 5PM CST.